This week i’ll be exploring four new albums of contemporary orchestral music that i’ve recently been spending time with, the first of which turned out to be a surprisingly big disappointment. 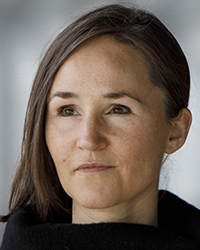 Last year i was very impressed by Recurrence, a disc put out by the Iceland Symphony Orchestra, mainly due to its inclusion of a three-movement work by Icelandic composer Daníel Bjarnason titled Emergence. 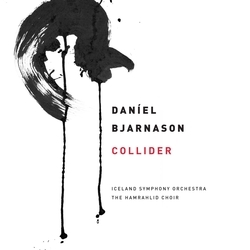 On the considerable strength of that piece, i’d been looking forward to Bjarnason’s latest album of music, Collider, released on Bedroom Community a little over a month ago. A digital-only release, it features three works: Blow Bright and Collider, both orchestral, plus a small-scale setting of lines from Shakespeare’s The Tempest for youth choir and orchestra, The Isle Is Full Of Noises. In my most recent mixtape, exploring the noble art of the remix, i included a track by Björk – ‘Crave (Odd Duck Mix)’ – that i mentioned had been made available as a download back in 2001, but which was no longer available. There were in fact four tracks that Björk released as downloads at that time, and since three of them have been unavailable for over a decade, i thought it would be interesting to revisit them. It’s worth saying at the outset that throughout her career Björk has been more responsible than most musicians for cultivating an extensive catalogue of remixes of her songs. 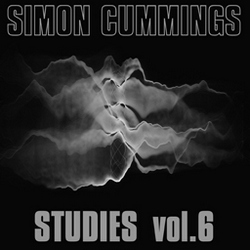 i began collecting her work in 1993, the year she began her solo career (having left the Sugarcubes), and each successive single felt like a substantial release, usually coming in the form of two or sometimes three CDs (later including videotapes or DVDs) containing a mixture of additional songs and remixes of the title track. The number of these remixes was at times considerable – one of her earliest singles, ‘Big Time Sensuality’ (1993), had as many as seven – but beyond this, these singles would also frequently include new renditions of other songs: ‘Violently Happy’ (1994) had acoustic versions of ‘Anchor Song’, ‘Come To Me’ and ‘Human Behaviour’, ‘Isobel’ (1995) featured a harpsichord version of ‘Venus as a Boy’, while ‘It’s Oh So Quiet’ (1995) – one of Björk’s only singles never to have been remixed – included three versions of ‘Hyperballad’, a song that wouldn’t be released as a single until the following year. First encounters can be unforgettable. Mine was in 2006, and it was the result of an entirely random purchase of an entirely random imported music magazine (German, i think) that contained a disc featuring a cluster of forgettable audio trifles plus a music video. When i hit play on that video, time suddenly started to slow down, and i became transfixed and deeply moved by the enormity of the music’s unusual mix of melancholy and beauty. 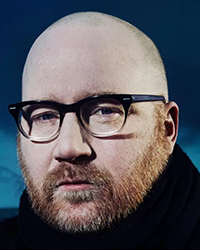 The music was ‘The Sun’s Gone Dim and the Sky’s Turned Black’, by Icelandic composer Jóhann Jóhannsson, whose sudden death has been reported in the last few hours. He was just 48.
i can’t claim to be an expert in Jóhannsson’s music. i love IBM 1401, A User’s Manual, the album of which ‘The Sun’s Gone Dim’ is the stunning final track, and i know a smattering of his other solo works. Being a movie addict, i’m also fond of the film scores of his that i’ve encountered thus far – particularly Denis Villeneuve’s Arrival – though as i still haven’t yet seen Sicario and Prisoners there remains much for me to explore. i’m certainly not going to miss The Mercy, which has just been released in the UK and has a Jóhannsson score, and there’s a couple more films still to come that feature his work. 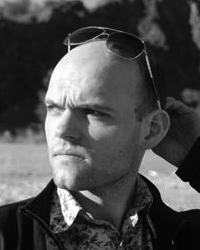 Even though there’s a great deal of Jóhann Jóhannsson’s music that i have yet to encounter, all i’ve heard thus far has testified to a composer with a unique sensitivity, capable in both his studio work and film scores of creating the most nuanced and above all human music, never contrived or ordinary, with an immediacy that i find genuinely uncanny. From the heart to the heart, indeed. i was reflecting on Jóhannsson last autumn, specifically how he had been replaced in Villeneuve’s Blade Runner 2049, which i think was unfortunate – i would have loved to have seen that movie with a Jóhannsson score (it would certainly have been far more inventive than Hans Zimmer’s ersatz Vangelis knock-off) – as well as the mutual decision by both Jóhannsson and Darren Aronofsky to refrain from creating a score for Aronofsky’s mother!. Considering that mother! turned out to be one of the most brilliant films not just of 2017, but ever, i was deeply impressed by a composer who recognised that there’s a time not to make music, that sometimes what’s needed is just the gentlest whiff of something that may not even be recognised as deliberate sound, which can speak with infinitely greater force and authenticity. In so many ways Jóhann Jóhannsson has impressed me since that unexpected first encounter nearly 11 years ago. i’m shocked and very sad indeed that he’s no longer with us, but i’m determined to make sure that i now get on with listening to everything else that he made while he was with us. i’ve no doubt there’ll be many more wonderful encounters to come. 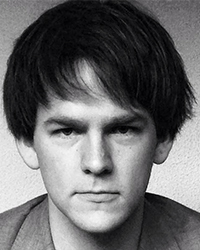 Rest in peace, Jóhann. 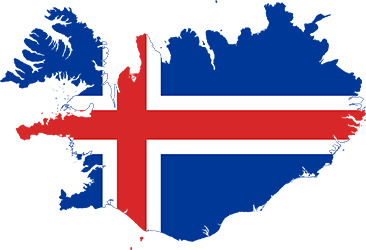 Today is Þjóðhátíðardagurinn, Iceland’s national day, celebrating their independence from Denmark and founding as a republic in 1944. Quite apart from Iceland being one of my favourite countries, its contribution to contemporary music (as seen in my recent Nordic CD review) is a challenging and imaginative one. 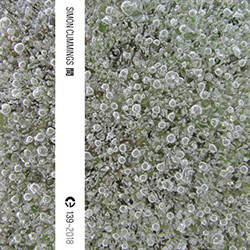 A very good example of this can be heard in Þráinn Hjálmarsson‘s orchestral work As heard across a room, composed in 2014. That simple, descriptive title immediately brings to mind another, Alvin Lucier’s I am sitting in a room, though while Lucier’s piece grapples with the literal effects of aural reality, Hjálmarsson is exploring them from a somewhat more figurative perspective.